NOTE: This story has been updated. Click here for the latest version. 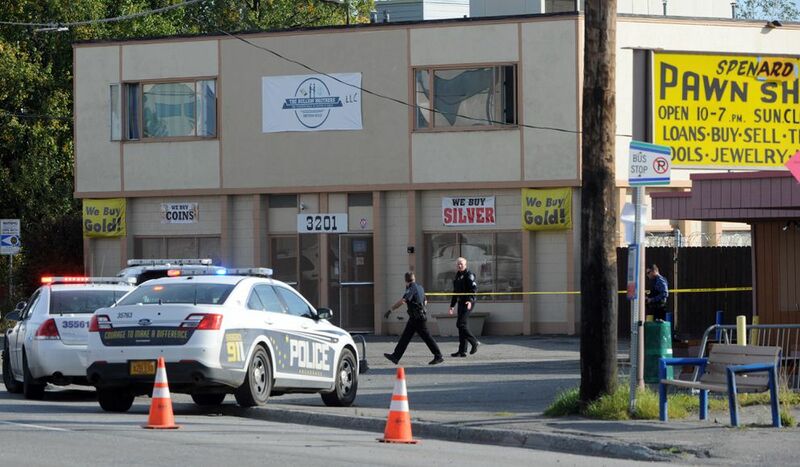 Three men were shot to death Tuesday morning at The Bullion Brothers shop, a gold and silver dealer in the Spenard neighborhood, Anchorage police say. Police aren't sure if the victims were employees, owners or customers of the shop, said spokesman MJ Thim. The owners of The Bullion Brothers shop could not immediately be reached Tuesday. Police said late Tuesday morning they had the alleged shooter in custody and were questioning him after receiving tips about the suspect's appearance and his vehicle, according to Thim. "We got our suspect," Thim said. Police said they spotted him on Dimond Boulevard and took him into custody near Dimond and Minnesota Drive. The identities of the victims and the man in custody had not been released as of Tuesday afternoon. "We don't have any indication of the motive," Thim said. He said investigators are questioning multiple witnesses. Twenty-eight people have been killed in Anchorage this year, according to figures provided by police spokeswoman Renee Oistad. That is three more homicide victims than at this time in 2016, which was the worst year on record for homicides in Anchorage with 34 victims. In an interview at Tuesday's Anchorage Assembly meeting, the chief of police, Justin Doll, said police suspect the killings were an isolated incident, a pattern he said has been followed in many of the year's homicides. "It's not just happening randomly on the street," Doll said. "Typically, the people involved know each other from some previous thing." Doll added: "Obviously, there's a risk associated with engaging in criminal activity, like drug sales. We encourage people not to do that." Mayor Ethan Berkowitz made a similar statement, standing outside of the Assembly chambers Tuesday night. "I understand the concern, we've got our work cut out for us," Berkowitz said. "But if you're not engaged in drug trafficking and not out after midnight, it's a very safe city." On Tuesday morning, one victim lay in the shop's doorway on his back with his feet extending outside. The body left the glass door propped open as police stretched a yellow police line around the shop's parking lot. Police received the call about a shooting shortly before 10 a.m., Thim said. The suspect had fled when police arrived. Police initially found a second body inside the business. Later, they found another man still alive in another part of the building. All had been shot, Thim said. The victim who was found alive died after he was taken to a hospital, police said. Witnesses in the area said they heard multiple shots. Gerrett Rhodes, general manager at Anchorage Printing across Spenard Road, said he heard an initial shot, then three more shots after that, and ordered that employees lock the doors. Fellow employees at the printing shop said they saw the shooter hovering over the man in the doorway before hearing more shots fired. Those employees said the shooter ran off, heading east down 32nd Avenue, carrying a black handgun, according to Rhodes. 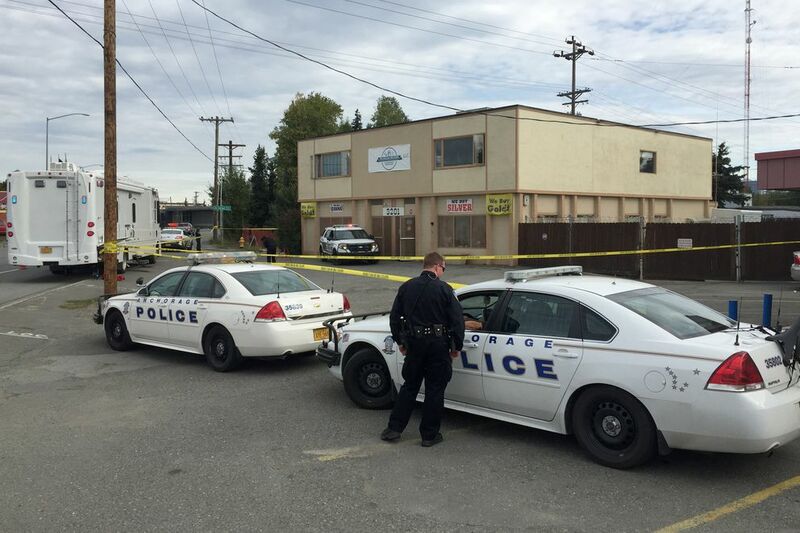 The last time so many people were killed in a single homicide event in Anchorage was May 13, 2015, in what was described as a domestic violence incident in an apartment on East 74th Avenue. Curtis Young III, 24, shot his girlfriend and their two young children before turning the gun on himself, police said. 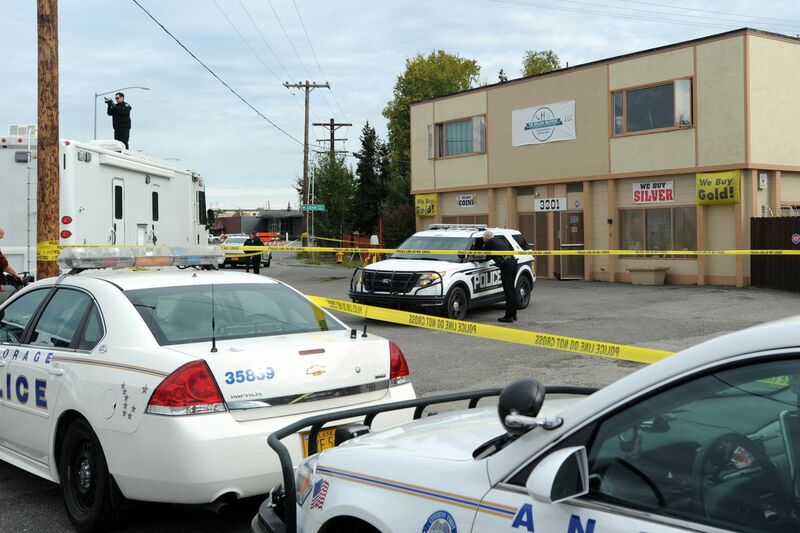 In an incident Monday that police are still investigating, a body was found at Aurora Paint Co.
Thim, the police spokesman, said there is "no indication" that the triple shooting is related to the discovery of that body. Police had initially not confirmed whether the investigation into the discovery of the body at Aurora Paint was being treated as a homicide. But the department said Tuesday afternoon that it is now investigating that case as a homicide. Autopsy results will determine the cause of death in that case. The current year-to-date homicide statistics include this victim, spokeswoman Renee Oistad said. As of Tuesday afternoon, police had not released the identity of the dead person found in the paint shop because his next of kin had not been notified, Oistad said. People with information about that incident, including surveillance video, are being asked to call police dispatch at 907-786-8900. To remain anonymous, people can contact Crime Stoppers at 907-561-STOP or online at anchoragecrimestoppers.com. Tegan Hanlon and Devin Kelly contributed reporting to this story.